Thinkers in Ancient Greece were among the first to try and construct a comprehensive model of the cosmos. With nothing but naked-eye observations, a few things could be worked out. The Moon loomed large in the sky so it was probably pretty close. Solar eclipses revealed that the Moon and Sun were almost exactly the same angular size, but the Sun was so much brighter that perhaps it was larger but farther away (this coincidence regarding the apparent size of the Sun and Moon has been of almost indescribable importance in advancing astronomy). The rest of the planets appeared no larger than the stars, yet seemed to move more rapidly; they were likely at some intermediate distance. But, could we do any better than these vague descriptions? With the invention of geometry, the answer became a resounding yes. The first distance to be measured with any accuracy was that of the Moon. In the middle of the 2nd century BCE, Greek astronomer Hipparchus pioneered the use of a method known as parallax. The idea of parallax is simple: when objects are observed from two different angles, closer objects appear to shift more than do farther ones. You can demonstrate this easily for yourself by holding a finger at arm’s length and closing one eye and then the other. Notice how your finger moves more than things in the background? That’s parallax! By observing the Moon from two cities a known distance apart, Hipparchus used a little geometry to compute its distance to within 7% of today’s modern value – not bad! The Moon was the first object whose distance was accurately measured. Credit and copyright: James Lennie. With the distance to the Moon known, the stage was set for another Greek astronomer, Aristarchus, to take the first stab at determining the Earth’s distance from the Sun. Aristarchus realized that when the Moon was exactly half illuminated, it formed a right triangle with the Earth and the Sun. Now knowing the distance between the Earth and the Moon, all he needed was the angle between the Moon and Sun at this moment to compute the distance of the Sun itself. It was brilliant reasoning undermined by insufficient observations. With nothing but his eyes to go on, Aristarchus estimated this angle to be 87 degrees, not terribly far from the true value of 89.83 degrees. But when the distances involved are enormous, small errors can be quickly magnified. His result was off by a factor of more than a thousand. Over the next two thousand years, better observations applied to Aristarchus’ method would bring us within 3 or 4 times the true value. So how could we improve this further? There was still only one method of directly measuring distance and that was parallax. But, finding the parallax of the Sun was far more challenging than that of the Moon. After all, the Sun is essentially featureless and its incredible brightness obliterates any view we might have of the stars that lurk behind. What could we do? By the eighteenth century, however, our understanding of the world had progressed substantially. The field of physics was now in its infancy and it provided a critical clue. Johannes Kepler and Isaac Newton had shown that the distances between the planets were all related; find one and you would know them all. But would any be easier to find than the Earth’s? It turns out that the answer is yes. Sometimes. If you’re lucky. The key is the transit of Venus. During a transit, the planet crosses in front of the Sun as seen from Earth. From different locations, Venus will appear to cross larger or smaller parts of the Sun. By timing how long these crossings take, James Gregory and Edmond Halley realized that the distance to Venus (and hence the Sun) could be determined (Interested in the nitty gritty of how this is done? NASA has a pretty nice explanation available here.). Now’s the time when I’d usually say something like: Seems pretty straightforward, right? There’s only one catch… But perhaps that’s never been more untrue. The odds were so stacked against success that it’s truly a testament to the importance of this measurement that anyone even attempted it. An astronomer traveling with Capt. 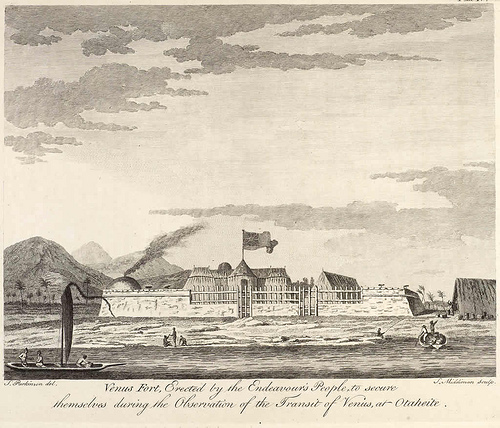 James Cook observed the 1769 transit of Venus from Tahiti. First off, transits of Venus are extremely rare. Like once-in-a-lifetime rare (although they do come in pairs). By the time Halley realized that this method would work, he knew that he was too old to have a chance to complete it himself. So, in hope that a future generation would undertake the task, he wrote out specific instructions on how the observations must be carried out. In order for the end result to have the desired accuracy, the timing of the transit needed to be measured down to the second. In order to have a large separation in distance, the observing sites would need to be located at the far reaches of the Earth. And, in order to ensure that cloudy weather didn’t ruin the chance of success, observers would be needed at locations all over the globe. Talk about a big undertaking in an era when transcontinental travel could take years. Despite these challenges, astronomers in France and England resolved that they would collect the necessary data during the 1761 transit. By that time, however, the situation was even worse: England and France were embroiled in the Seven Years’ War. Travel by sea was nearly impossible. Nevertheless, the effort persisted. Although not all observers were successful (clouds blocked some, warships others), when combined with data collected during another transit eight years later, the undertaking had been a success. French astronomer Jerome Lalande collected all the data and computed the first accurate distance to the Sun: 153 million kilometers, good to within three percent of the true value! A brief aside: the number we’re talking about here is called the Earth’s semi-major axis, meaning that it’s the average distance between the Earth and the Sun. Because the Earth’s orbit isn’t perfectly round, we actually get about 3% closer and farther throughout the course of a year. Also, like many numbers in modern science, the formal definition of the astronomical unit has been altered a bit. As of 2012, 1 AU = 149,597,870,700 meters exactly, regardless of whether we find the Earth’s semi-major axis is slightly different in the future. Since the groundbreaking observations made during the transit of Venus, we’ve refined our knowledge of the Earth-Sun distance tremendously. We’ve also used it to unlock an understanding of the vastness of the Universe. Once we knew how large the Earth’s orbit was, we could use parallax to measure the distance to other stars by making observations spaced out by six months (when the Earth has travelled to the other side of the Sun, a distance of 2 AU!). This revealed a cosmos that stretched on unendingly and would eventually lead to the discovery that our universe is billions of years old. Not bad for asking a straightforward question! You might have mentioned that a less accurate, but more commonly occuring method for obtaining the sun’s distance is the transits of Mercury. Those were done after the telescope came into use, but before the Transits of Venus were available. Thanks for the history. It surprised me to find out that Aristarchus also believed in a sun centered model way before Copernicus. 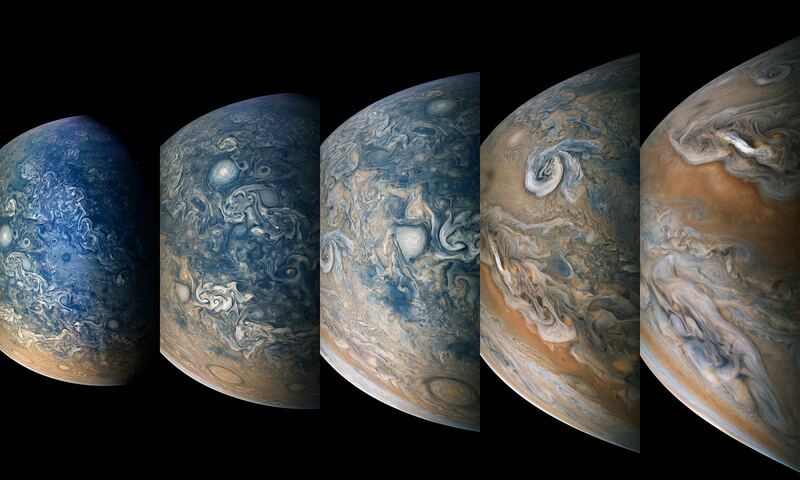 He determined that the orbit of Jupiter’s main moons seemed to lag by about 22 minutes, which would be consistent with light taking 11 minutes to cover the radius of Earth’s orbit. This was out – the actual figure is about 8 minutes 20 seconds. This does not give us the radius of the earth’s orbit in ordinary units unless you first know the speed of light, and back then they did not have a good figure. Nice picture of Vens Fort – Cook is one of my heros. The next transit of Mercury is 9th May 2016 the UK is well placed to observe it! Thanks for pointing out the NASA link to the detailed explanation. I’m amazed how Halley figured it out – the whole math is, on the one hand, “just” using trigonometry, ie stuff we learn today in high school, but, on the other hand, all considerations in the explanation of NASA make it clear that the measurement itself is not at all that trivial as just multiplying a known distance, say, the radius of the Earth, with some angle’s sine. There’s much more behind it. Great article describing one of the great accomplishments of humanity! Thanks! Previous PostPrevious Good Morning, Space Station … A Dragon Soars Soon!